Google Offers Sneak Peek at Your Available Spectrum article tells that Google.org is publicizing a Spectrum Database that monitors unused spectrum frequencies (a.k.a. white space) across the US. The aim is to allow industry stakeholders and the public to utilize unoccupied frequency ranges better through dynamic spectrum sharing. The database is undergoing a public trial with the FCC to test its validity. For more information read Google Spectrum Database documentation. After that Browse spectrum on map to get idea how this system works. Anyone can access the Spectrum Database to search for unused spectrum in your area, and it is planned that in the future registered devices will check from it which frequencies they can use and different areas automatically. Currently, there is a global move to convert TV stations from analogue to digital transmission. Due to the spectrum efficiency of DTV, some of the spectrum bands used for analog TV will be cleared and made available for other usage. The COGEU project capitalizes on the fact that: the switch-over from analogue to digital terrestrial TV in Europe will free up highly valuable radio frequencies due do the greater efficiency of digital broadcasting transmission. This ‘digital dividend’ has great potential for the provision of a wide range of services, as the radio signals in this range travel far and equipment can be easily used indoors. 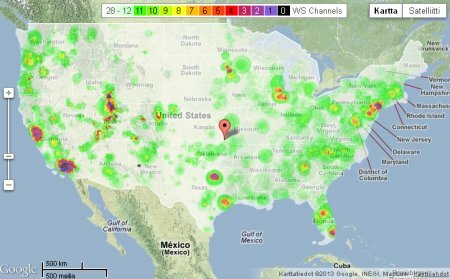 The United States has long been a pioneer in the use of the ‘white spaces’ between broadcasts by users of unlicensed transmitter devices. enthusiasm for white space usage in the US has been damped by discussions on the spectrum incentive auctions which may impact the amount of white space spectrum available in the UHF band. Already, trials have been undertaken in Germany, Finland, Singapore, the United Kingdom, and the United States and further ones are planned in Brazil, Japan, and South Africa. Last September, the European Commission (EC) issued a communication on promoting spectrum sharing in which it advocated the deployment of white space devices based on harmonised standards for geo-location databases. For further information on using white spaces in Europe, please see two European research projects, COGEU and QUASAR, which were both co-financed by the European Union as part of its FP7 research programme. The Open Spectrum Alliance is united by the goal of realizing the potential social and economic benefits of this underutilized natural resource by promoting innovative public policies. Google’s first trial to use the unused channels in the broadcast TV spectrum to provide wireless broadband access launched in 2010 in Logan, Ohio. M2M applications, such as smart meters are a great example of how white space spectrum can be utilized efficiently. Smart meters typically deliver information in short bursts and involve relatively small file transfers. They are fairly delay insensitive and don’t require a report to be delivered exactly at a given hour, minute or second. Because there are minimal timing requirements required for smart meters, this maps very nicely to the nature of white space spectrum due to the fact that sometimes it is available and sometimes it isn’t because of the very nature of temporary primary user interference. For M2M connections such as smart meters that are not time-sensitive, white space spectrum is the ideal partner. As companies and researchers continue to explore opportunities with white space spectrum, M2M will be a main focus and has the potential to be an incubation ground for white space. The M2M market is growing at an exponential rate. In 2022, 18 billion M2M connections are expected of which 2.6 billion will be based on mobile technology. At that time, 22 percent of all mobile connections will be M2M compared to the current 2 percent. Another use case explored was the opportunities for TV White Space in machine-to-machine (M2M) communication for several verticals with distinct requirements. While the majority of the connected home applications don’t need to be secure, some industries such as the utility industry will need very secure implementations. In addition, TV White Space can use lower frequencies and can be ideal for opportunistic low data rate M2M connections that are not time sensitive, even if the spectrum is shared. The longer-range characteristics of TV White Space channels also facilitate data collection and transfer over longer distances. We are a group of volunteers and opening a brand new scheme in our community. Your web site provided us with useful info to paintings on. You’ve done a formidable job and our entire group will be grateful to you. It has the just like you understand my head! You appear to understand a good deal relating to this, just like you submitted the actual e-book in it or anything. I believe that you just could possibly employ some Percentage to push the solution household somewhat, but instead of that will, this is outstanding site. An outstanding examine. I most certainly will certainly again.